If it's Tuesday, it's time for trivia at Denizens! Whether you are a diehard fan who has been playing with us for years, or a newbie to Denizens for our weekly, free Tuesday trivia, be sure to join us and test your knowledge of facts you never knew that you never knew. Win free rounds for your next visit, and be a part of the best trivia crowd in Silver Spring. 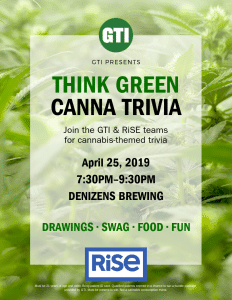 Think Green Canna Trivia @ Denizens Brewing Co. Registration with Rise Dispensary 7:30 – 9:30 PM We welcome everyone to join the fun, whether you're a trivia master, curious about cannabis, or just a lover of beer. RISA will be registering people for medical marijuana cards and have special giveaways for patients. Enjoy delicious beer, and win some awesome prizes! Email [email protected] with your team name and number of members to be registered for Trivia, you can also register the night of.